FLORA FORCE® FENUGREEK capsules are traditionally used to promote lactation and enhance milk secretion. Use fenugreek after birth, or when milk supply slows down – such as when you return to work. Avoid taking FLORA FORCE® FENUGREEK capsules if you are pregnant. Read all of this leaflet carefully because it contains important information for you. FLORA FORCE® FENUGREEK capsules are available without a doctor’s prescription, for you to treat a mild illness. Nevertheless, you still need to use FLORA FORCE® FENUGREEK capsules carefully to get the best results from it. Do not share FLORA FORCE® FENUGREEK capsules with any other person. FLORA FORCE® FENUGREEK capsules are free from sugar and lactose. 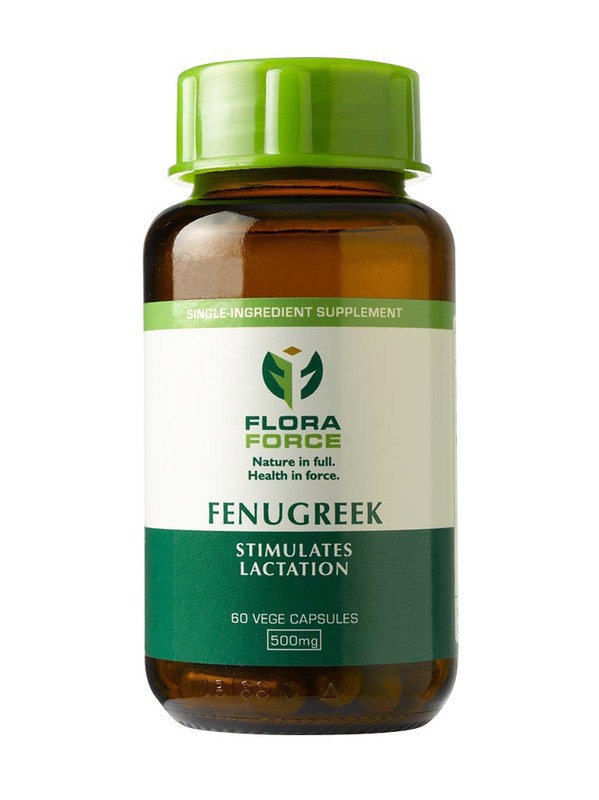 FLORA FORCE® FENUGREEK capsules are traditionally used to promote lactation. If you are allergic to any of the ingredients in FLORA FORCE® FENUGREEK capsules. If you have a bleeding disorder (see “Take special care with FLORA FORCE® FENUGREEK capsules”). If you have diabetes (see “Take special care with FLORA FORCE® FENUGREEK capsules”). Surgery (see “Take special care with FLORA FORCE® FENUGREEK capsules”). Pregnancy and lactation (see “Pregnancy and breastfeeding”). Suffer from a bleeding disorder. You may have to arrange increased monitoring of your blood levels when starting or stopping treatment with FLORA FORCE® FENUGREEK capsules (see “Do NOT take FLORA FORCE® FENUGREEK capsules”). Suffer from Diabetes. You may have to arrange increased monitoring of your blood sugar levels (see “Do NOT take FLORA FORCE® FENUGREEK capsules”). If you are undergoing surgery discontinue use at least 2 weeks prior to the procedure (see “Do NOT take FLORA FORCE® FENUGREEK capsules”). Take iron, as it may decrease the bio-availability of iron. You may have to arrange increased monitoring of your iron levels when starting or stopping treatment with FLORA FORCE® FENUGREEK capsules” (see “Taking other medicines with FLORA FORCE® FENUGREEK capsules”). Take warfarin or other blood thinning medicines. You may have to arrange increased monitoring of your INR (International Normalised Ratio) levels when starting or stopping treatment with FLORA FORCE® FENUGREEK capsules” (see “Taking other medicines with FLORA FORCE® FENUGREEK capsules”). Take anti-diabetic medicines. You may have to arrange increased monitoring or your blood glucose / sugar levels when starting or stopping treatment with FLORA FORCE® FENUGREEK capsules (see “Taking other medicines with FLORA FORCE® FENUGREEK capsules”). The use of FLORA FORCE® FENUGREEK capsules in children and adolescents under 18 years of age is not recommended due to lack of adequate data (see “HOW TO TAKE FLORA FORCE® FENUGREEK capsules”). FLORA FORCE® FENUGREEK capsules should be taken after meals with water. Safety of FLORA FORCE® FENUGREEK capsules during pregnancy has not been established. Avoid taking FLORA FORCE® FENUGREEK capsules if you are pregnant. If you are pregnant or breastfeeding your baby, please consult your pharmacist or registered healthcare practitioner for advice before taking FLORA FORCE® FENUGREEK capsules. No studies on the effect on the ability to drive and use machinery have been performed. It is unlikely that FLORA FORCE® FENUGREEK capsules will impair your ability to drive or use machines. However, please exercise care when driving or operating machinery until you know how FLORA FORCE® FENUGREEK capsules affects you. FLORA FORCE® FENUGREEK capsules are sugar free. Please discuss the use of the following medicines in combination with FLORA FORCE® FENUGREEK capsules with your doctor or pharmacist. Theophylline for the treatment of respiratory diseases such as COPD (chronic obstructive pulmonary disease) and asthma. The dose of the above medications may need to be adjusted when taken in conjunction with FLORA FORCE® FENUGREEK capsules. Taking the above-mentioned medicines at the same time as FLORA FORCE® FENUGREEK capsules can lower or increase their effectiveness. These medicines must be taken at least 2 hours before or after FLORA FORCE® FENUGREEK capsules. Warfarin or other blood thinning medicines. FLORA FORCE® FENUGREEK capsules may potentially increase the effect of blood thinning medicines. You may have to arrange increased monitoring of your INR levels when taking FLORA FORCE® FENUGREEK capsules (see “Take special care with FLORA FORCE® FENUGREEK capsules”).Antidiabetic medicines as FLORA FORCE® FENUGREEK may further lower blood sugar levels. Monitor you blood glucose / sugar levels regularly if you are using FLORA FORCE® FENUGREEK capsules and antidiabetic medicines in combination (see “Take special care with FLORA FORCE® FENUGREEK capsules”). Always take FLORA FORCE® FENUGREEK capsules exactly as directed. You should check with your pharmacist if you are unsure. Take 2 capsules twice daily with meals or as directed by your doctor, pharmacist or healthcare professional. 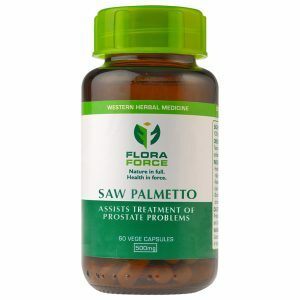 Not recommended for use (see “Take special care with FLORA FORCE® FENUGREEK capsules”). FLORA FORCE® FENUGREEK capsules may be taken for a period of up to 12 weeks followed by an interval of 1 week after which the next 12-week period can commence. However, should you experience any adverse effects or any of the side effects indicated below please consult your healthcare practitioner. If you take more FLORA FORCE® FENUGREEK capsules than you should, you may experience an increased heart rate, high blood pressure and chest pain. In the event of over dosage, consult your doctor or pharmacist. If neither is available, contact the nearest hospital or poison control centre. Always take FLORA FORCE® FENUGREEK capsules as directed. If you miss a dose, take it as soon as you remember. If you do not remember the missed dose till the next dose is due, skip the missed dose and go back to your regular dosing schedule of two capsule twice daily. Do not take a double dose to make up for forgotten individual doses. FLORA FORCE® FENUGREEK capsules may have side-effects. Not all side-effects reported for FLORA FORCE® FENUGREEK capsules are included in this leaflet. Should your general health worsen or if you experience any untoward effects while taking FLORA FORCE® FENUGREEK capsules, please consult your doctor, pharmacist or other health care professional for advice. An allergic reaction which may present with nasal congestion, hoarseness, persistent coughing, wheezing, swelling of the face, tongue or whole body. Signs of shock such as low blood pressure, rapid shallow breathing, cold and clammy skin, rapid weak pulse, dizziness, fainting or weakness. Signs of decreased blood sugar such as light headedness, blurred vision and confusion. More urine than is normal for you. Heartburn, stomach discomfort and pain, diarrhoea, bloated stomach, flatulence. If you notice any side-effects not mentioned in this leaflet, please inform your doctor or pharmacist. 60 Capsules in 125ml amber glass bottle with light green screw cap and safety seal insert, in a box. Trigonella foenum-graecum seed is thought to act via stimulation of sweat production, thereby enhancing milk secretion (the breast is a modified sweat gland). A hypersensitivity to the Fabaceae family including soybeans, peanuts, chick peas and green peas. Theoretically, patients who are allergic to other Fabaceae plants, might also be allergic to fenugreek, as in, FLORA FORCE® FENUGREEK capsules. Diabetes (see “WARNINGS AND SPECIAL PRECAUTIONS“). Surgery (see <“strong>WARNING AND SPECIAL PRECAUTIONS”). When starting, or stopping treatment with Trigonella foenum-graecum containing products, including FLORA FORCE® FENUGREEK capsules, patients with bleeding disorders should have increased monitoring of their INR (International Normalised Ratio) levels (see “CONTRA-INDICATIONS“). FLORA FORCE® FENUGREEK capsules should be used with care in patients with diabetes as curcumin may decrease blood sugar levels. Diabetic patients should monitor their blood sugar levels when taking FLORA FORCE® FENUGREEK capsules (see “CONTRA-INDICATIONS”). FLORA FORCE® FENUGREEK capsules should be used with caution in patients with iron deficiency. Patient should monitor their iron levels (see “CONTRAINDICATIONS”). When starting, or stopping treatment with FENUGREEK containing products, including FLORA FORCE® FENUGREEK capsules, patients taking warfarin (or other coumarin anticoagulants) should have increased monitoring of their INR (International Normalised Ratio) levels (see “INTERACTIONS”). FLORA FORCE® FENUGREEK capsules should be used with care in patients taking sedative medications, including Midazolam, as it may increase its sedative effects (see “INTERACTIONS”). Vitamins and minerals obtained from other sources should be taken into consideration when taking FLORA FORCE® FENUGREEK capsules. Effects on the ability to drive or use machinery: No studies on the effect of FLORA FORCE® FENUGREEK capsules on the ability to drive or operate machines have been performed. It is unlikely that FLORA FORCE® FENUGREEK capsules capsules will affect the ability to drive or operate machines. FLORA FORCE® FENUGREEK capsules may interact with the following medicines:. Beta blockers: curcumin may decrease the absorption of talinolol and may increase the absorption of celiprolol. Sulfasalazine: Curcuma longa might increase absorption of sulfasalazine. Advise patients to take any of the above-mentioned medicines at least 2 hours before or after FLORA FORCE® FENUGREEK capsules. Curcuma longa, as in FLORA FORCE® FENUGREEK capsules, may potentially increase the effect of oral anti-coagulants and anti-platelet drugs (e.g. warfarin, aspirin, clopidogrel, dalteparin, enoxaparin, heparin, ticlopidine) when taken in conjunction. Patients taking anti-coagulants or antiplatelet medicines should have their INR levels monitored more frequently when taking FLORA FORCE® FENUGREEK capsules (see “WARNINGS AND SPECIAL PRECAUTIONS”). `Theoretically, Curcuma longa, as in FLORA FORCE® FENUGREEK capsules, might increase levels of p-glycoprotein substrates. Some of these medicines include chemotherapeutic agents, antifungals, protease inhibitors, H2 agonists, calcium channel blockers, digoxin, corticosteroids, erythromycin, cisapride, fexofenadine, cyclosporine, loperamide and quinidine. Curcuma longa, as in FLORA FORCE® FENUGREEK capsules, may increase the sedative effects of Midazolam. Patients taking Midazolam should use FLORA FORCE® FENUGREEK capsules with caution (see “WARNINGS AND SPECIAL PRECAUTIONS”). There is some evidence that Curcuma longa and/or curcumin may interact with CYP3A4 enzymes and increase bioavailability of medicines metabolised by cytochrome P450 isoenzymes CYP3A4. Patients taking medicines metabolised by these enzymes should use FLORA FORCE® FENUGREEK capsules cautiously. Some of these medicines include calcium channel blockers, chemotherapeutic agents, antifungals, glucocorticoids, alfentanil, cisapride, fentanyl, lidocaine, losartan, fluoxetine, omeprazole, ondansetron and fexofenadine. There is some evidence that Curcuma longa may interact with CYP1A2 enzymes and increase the bioavailability of medicines metabolised by cytochrome P450 1A2 isoenzymes CYP1A2. Patients taking medicines metabolised by these enzymes should use FLORA FORCE® FENUGREEK capsules cautiously. Some of these medicines include clozapine, fluvoxamine, haloperidol, imipramine, olanzapine, pentazocine, propranolol and zolmitriptan. There is some evidence that Curcuma longa as in FLORA FORCE® FENUGREEK capsules, may increase levels of certain antineoplastic agents. Some of these include docetaxel, paclitaxel, etoposide, vinblastine, vincristine and vindesine. Theoretically, Curcuma longa may decrease the absorption of iron. Patients taking iron should monitor their iron levels when taking FLORA FORCE® FENUGREEK capsules. The safety and efficacy of FLORA FORCE® FENUGREEK capsules during pregnancy and lactation have not been established. FLORA FORCE® FENUGREEK capsules should therefore not be taken during pregnancy and lactation. Take 2 capsules twice daily with meals or as prescribed. The following side-effects may occur with the use of FLORA FORCE® FENUGREEKcapsules. Frequency unknown: Constipation, flatulence and yellow, hard stools, nausea and vomiting, diarrhoea or loose stool, dyspepsia, gastritis, distension and gastroesophageal reflux disease, abdominal fullness and pain, epigastric burning and tongue staining. Frequency unknown: Pruritus, pitting oedema, photosensitivity. None known. Contact a poison control centre in area. Clear size 0 all vegetable capsule containing dark yellow herbal powder. Read more about breastfeeding in our blog ‘Are you breastfeeding your baby?’. FLORA FORCE® FENUGREEK capsules contain fenugreek (Trigonella foenum-graecum) seed powder. Fenugreek has been traditionally used to promote lactation and enhance milk secretion. Use fenugreek after birth, or when milk supply slows down – such as when you return to work.